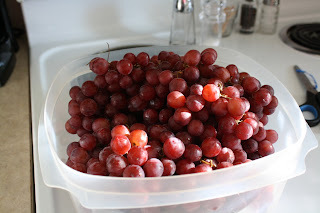 Dear All Day Nausea, I have not missed you. You are not my friend. I know you and the toilet are best friends, but I prefer not to be a part of your little clique. You are a bad influence on me. But you've already moved yourself in, and, only time will tell when you'll pack your bags and leave me alone! 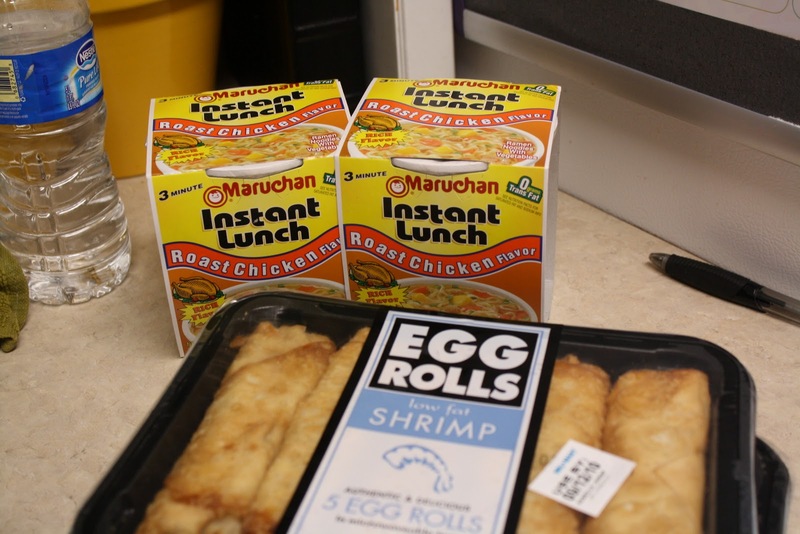 In the meantime, I'm finding myself making random purchases at the grocery store to try to keep you at a distance until you take the hint and hit the road! 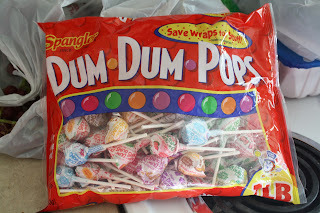 I heard about those fancy preggy pops, but I couldn't find any. 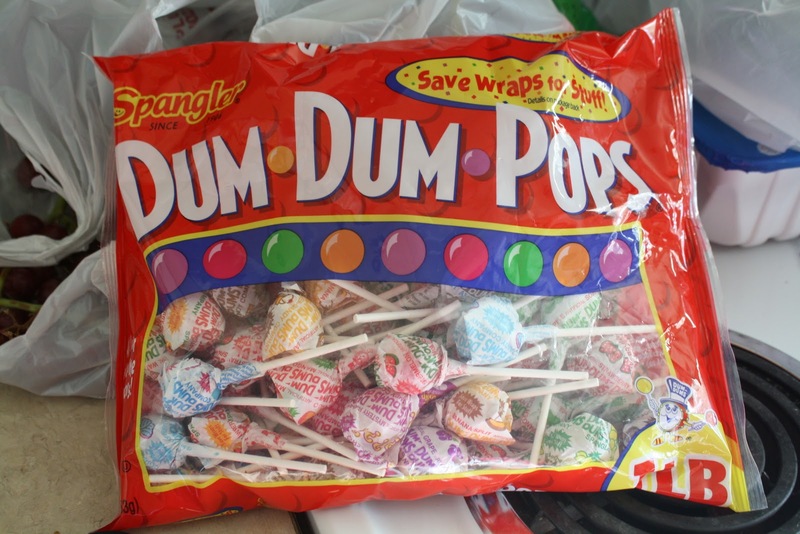 So I got some Dum Dum Pops instead. And, surprisingly, sucking on them does bring a bit of relief! I don't know that I have EVER purchased these fancy Ramen Noodles before, and I certainly don't buy frozen egg rolls often, but for some reason that's all I desired for dinner last night! So weird! I did redeem myself by buying a huge bag of grapes and snacking on those after the not-so-healthy dinner. Notice the huge gash on his eye lid. 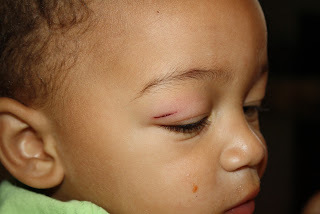 He totally slammed face first into our neighbor's TV stand. His eye lid was spit open at first, but it healed up really fast. No stitches, thank God! That boy is a trooper! 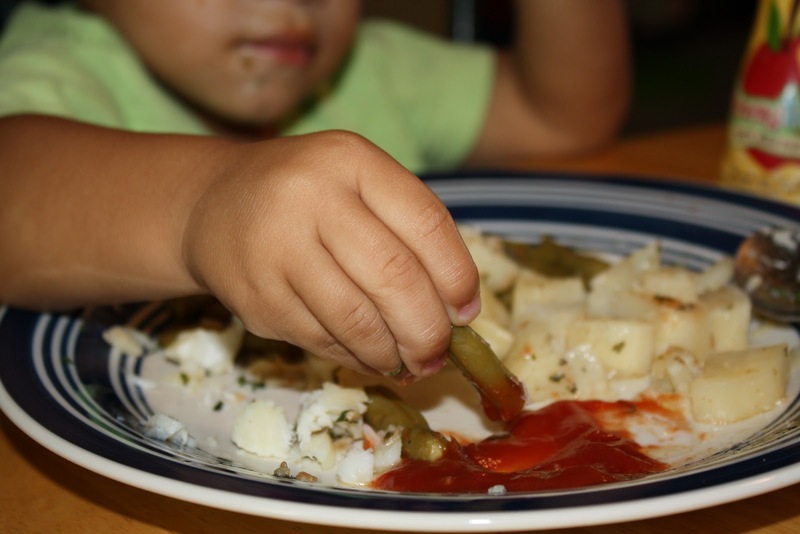 Ever had green beans and ketchup? Me neither. But Silas made it look appetizing. 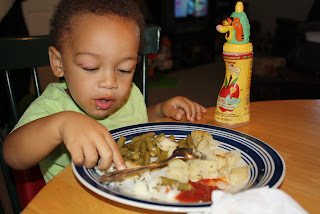 While Mom is eating weird stuff, Silas is having a well-balanced meal of baked fish, green beans, and baked potato.